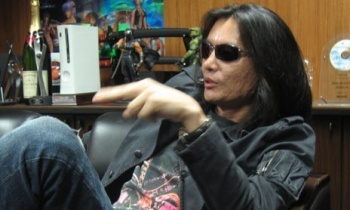 Ninja Gaiden creator Tomonobu Itagaki has admitted that he needs a healthy dose of his vices to help him make a game, and nobody was surprised. Let's be honest here: Game development is stressful work. Not only do you have to wrangle teams, squash bugs, deal with publishers and funding, but then you've got the legions of stupid, stupid fanboys on the internet ready to tear apart whatever you post. It must be even more stressful if, for example, you're Ninja Gaiden mastermind Tomonobu Itagaki, who left Tecmo in 2008 and was engaged in a long, drawn-out legal battle for months and months on end afterward - in fact, it wasn't formally settled until last February. Is it any wonder, then, that Itagaki needs something to help take the edge off his day? When speaking with 1UP about his current project with new studio Valhalla, Itagaki was asked what was most important to his "daily well being," smokes, coffee, alcohol, or gambling? His response? "It's already clear. I can't make a game without all of them." In fact, during the development time of his as-of-yet-unannounced game, Itagaki revealed he'd consumed "at least 1,000 shochu sake bottles," shot a million photos with his D-SLRs (Digital Single-Lens Reflex cameras), and put 2,000 railway cars on his little model trains. And while the last two aren't exactly considered vices, they probably help ease the stress (because damn, that's a lot of little trains). On a completely different note, Itagaki was also asked what he thought about the apparent reluctance of many Japanese publishers to make games with female main characters - given that his Dead or Alive series, could he see a game like Ninja Gaiden with a female Ryu Hayabusa being successful? Itagaki's answer was simple: "Half of mankind is female." So yes, he supports female main characters, he'll just probably give them massive breasts.